Photo from The Signal Archives. Given Georgia State’s reputation as an “engine for social mobility” and a diverse university that propels black and minority students to graduation, it is valuable to put the university’s current state in context with its cultural history. This gem—by no means the only one of its kind, for there were several editorials in support of segregation—comes nestled between other relics, like advertisements for Camel cigarettes, articles protesting the Vietnam War, support of voter literacy tests and comics of Colt 45. 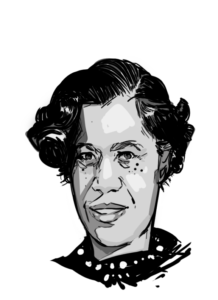 “To place the articles in context, we must remember that the U.S. Supreme Court ruling on Brown v. Board of Education was handed down in 1954. (There was a follow-up ruling also in 1955.) Brown v. Board of Education ordered that schools be integrated, but many schools in the South purposefully delayed the implementation of the ruling. Georgia State appears to have been one of the schools to try to do that,” Ralph LaRossa, professor emeritus in the sociology department, said. The Georgia State Signal frequently commented on the civil rights movement, though, as in the excerpt above, they didn’t always call it the civil rights movement; writers regularly denounced groups like Student Nonviolent Coordinating Committee (SNCC) and Black Power movements for being “extreme,” and urged activists to be more like Martin Luther King Jr. and peddle a philosophy of pacifism. To their credit, and perhaps explaining why The Georgia State Signal billed itself as the “Newspaper of the South’s Progressive Urban College,” they also condemned the Ku Klux Klan, who found their home in Stone Mountain. 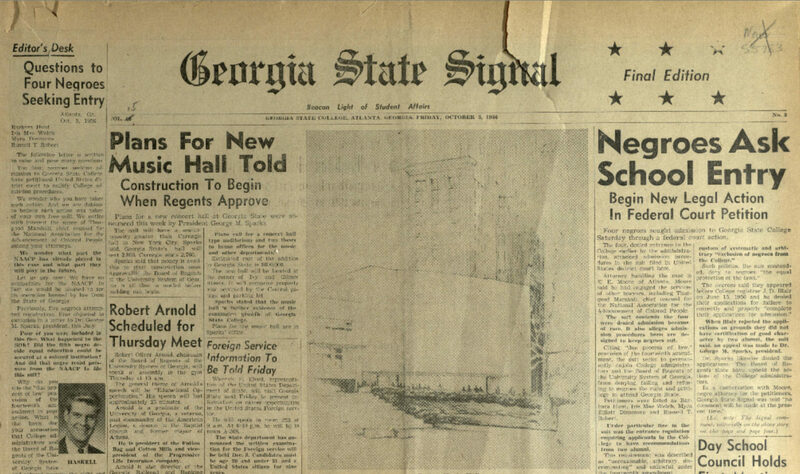 Georgia State’s first black student was Annette Lucille Hall, who attended classes in June of 1962, a year after the University of Georgia and Georgia Tech integrated. Upon integration, there was little backlash or fanfare; the city’s attitude had already begun to shift, in part due to Judge Boyd Sloan’s rulings that black students must be allowed to attend Georgia State. Minority students still did not feel welcome thirty years later, though, per the 1991 Georgia State yearbook. Over 75 percent of students were white and informal social segregation was common in cafeterias and between student organizations, including The Signal. “No one wants to or likes to be places where they don’t feel welcomed. Album 88, Signal and organizations like the concert committee are places where blacks don’t feel comfortable,” Ricardo Fludd said in 1991. Over the next few decades, Georgia State learned to better cater to minority students. Since then, Georgia State has become a “national leader in the success of all students, closing a number of gaps,” Jonathan Gayles, a professor in the African-American Studies department, said. “The distance that Georgia State has travelled since that time to the present is very impressive and we’re being recognized nationally for that,” Gayles said. The significance of nodding to a racist past is to note the rationale used to morally justify racism and other discriminatory, unjust practices. Indeed, there are strong parallels between The Signal’s old journalism and current rhetoric by politicians, pundits and social media users. For example, Tucker Carlson of Fox News disparaged immigrants by characterizing them as mostly “nice” individuals, but comprising a demographic change that is fundamentally harmful for particular people’s psyches. “How would you feel if that happened in your neighborhood?” he asked viewers. Indeed, the claim that integration and representation are “social rights” that can only be granted by society and not legislation is precisely what some politicians and conservative social scientists are claiming today. 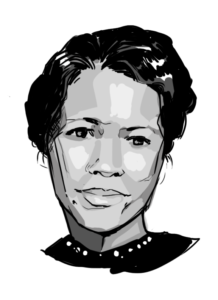 To avoid falling for seductive, subtly racist rhetoric, Akinyele Umoja, an African-American Studies associate professor, recommends that people thoroughly educate themselves and surround themselves with people of diverse identities. “People have to study and just as there’s so-called scholarship that promotes racist ideas, [there’s] scholarship that affirms the humanity of people of color and women and LGBTQ people,” Umoja said. He also noted that students have a voice when it comes to issues like racial equality.